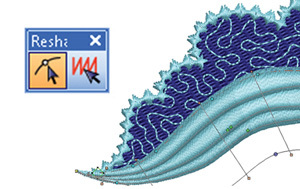 DecoStudio® e3 delivers new tools, features and power to help you achieve all of your embroidery and design ambitions. 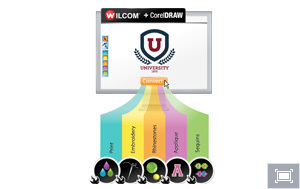 Plus, you also benefit from the new tools and enhancements featured from the latest CorelDRAW® release. 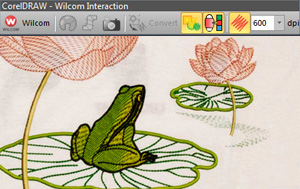 The workflow between CorelDRAW and the Wilcom software is now even smoother, allowing you to visualize graphics and embroidery together with the TrueView embroidery in CorelDRAW X6. DecoStudio e3 makes exploring .EMB files, including multi-decoration graphics, faster and easier with new extra-large TrueView thumbnails. Browse through .EMB files in the Corel CONNECT built-in content organizer or Windows Explorer to get a clear look at what’s in your .EMB files and clipart before opening them. With 15 new alphabets and more control over your lettering designs, creating and fine-tuning stunning monograms and other lettering is effortless with DecoStudio. Use any of the 150 pre-digitized fonts for speed, precision and no thread breaks. 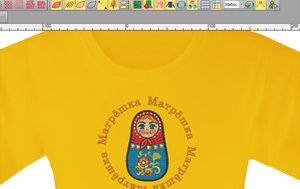 DecoStudio brings you higher-quality vector-to-embroidery conversion with turning and parallel fills. Additional enhancements to the Auto Fabrics settings mean the best stitch settings will automatically be set for you, whether you’re working with fleece, pique or cotton. Add more functionality to your DecoStudio with three optional Elements. 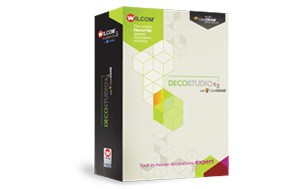 Once you own DecoStudio e3, you can purchase any of the individual elements at any time. 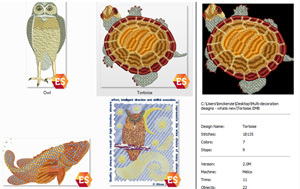 In one click, DecoStudio converts any vector shape into production-ready embroidery, appliqué or bling designs. You’re then free to edit and enhance as desired. 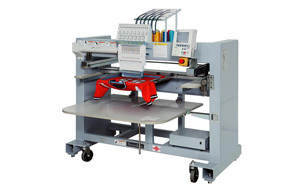 You also have the option of digitizing your embroidery designs using manual tools. 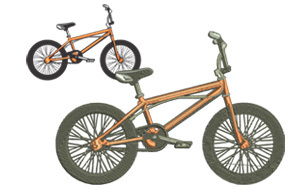 For bitmap graphics, use CorelDRAW’s tracing features to convert bitmaps to vector graphics first. 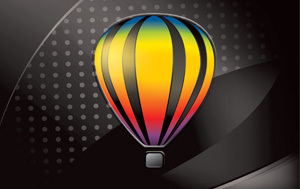 With DecoStudio’s seamless integration with CorelDRAW Graphics Suite X6, the options are endless for creating brilliant, all-purpose designs. Create designs layered with print, embroidery, appliqué and rhinestones, and export them to the required file formats for production. Wilcom is famous for quality lettering. 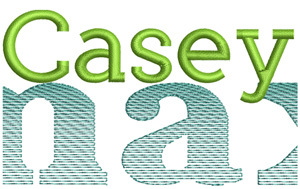 Use any of the 150 pre-digitized fonts for speed, precision and no thread breaks. You can also convert any TrueType fonts with ease. DecoStudio gives you complete control, including font color, scaling, font style, straight text or curved, stitch sequence and more. 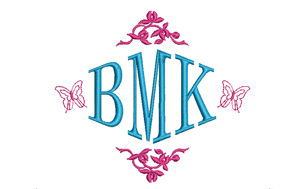 Monograms are easy with DecoStudio—choose a style, then add borders and motifs for quick personalized gifts. 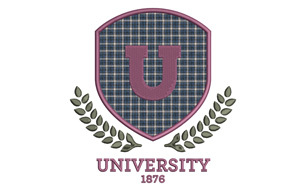 DecoStudio’s handy Auto Fabrics tool automatically applies the best-practice embroidery settings for underlay, pull compensation and stitch density settings based on your chosen fabric. Whether you’re working with fleece, pique or cotton, the stitching is automatically adjusted for best results. 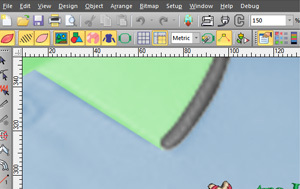 DecoStudio provides you with true object-based editing to refine embroidery designs as needed. Edit embroidery in the same way you adjust vector files, change color sequencing, stitch types and remove small stitches automatically. Additional features such as the Knife tool make splitting embroidered shapes into separate pieces a cinch. Add more functionality to your DecoStudio with Elements. 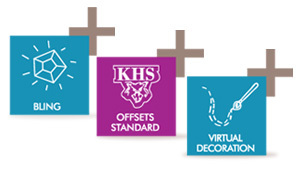 Choose from three fantastic options: Bling, Virtual Decorations and Offsets. By adding just the elements you need, you invest only in the tools that directly support profit. 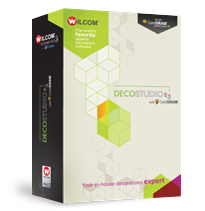 If you already own DecoStudio e3, you can purchase any of the individual Elements at any time. Light up your designs with rhinestones! With Bling, you’re in complete control of where each stone drops. Bling lets you place each stone individually, pinpoint the shape, size and placement of each stone, run a string of stones along a digitized line, and fill areas with complex shapes (with or without holes). 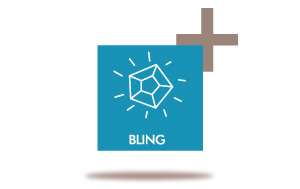 Bling also gives you full control of overlaps by removing them for you, ignoring them, or highlighting them for you to go through individually or as groups. Edit each stone or group of stones for shape, size, color, even removal. When using cutting templates, Bling creates a single cutter file or separate files for each size stone and color. 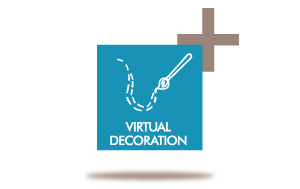 Virtual Decoration brings the rich look of embroidery to your printed designs. Start with our industry standard TrueView—a realistic simulation viewing tool that previews how designs will look when embroidered. That view includes “real” thread lines, shadows and highlights. With Virtual Decoration, a special high-resolution image of the TrueView simulation will be rendered to print onto your fabric. 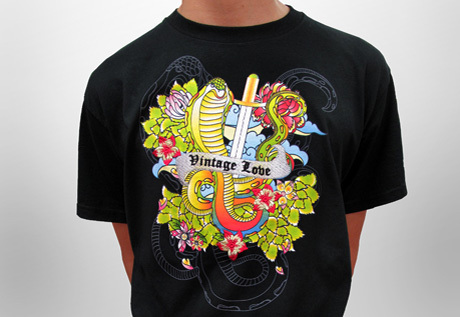 The result is an inexpensive way to print virtual embroidery, taking price pressure off your real embroidery. 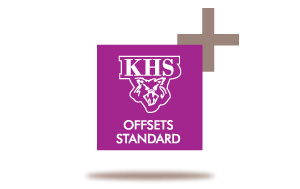 Offsets lets you wrap borders precisely around the shape of any closed object—vectors, runs and more. Use Offsets to embolden logos, badges and more. It’s a perfect way to easily add highlights and borders to your customer’s designs. Create multiple offsets and place them inside, around or outside the original object. With DecoStudio Offsets, you’ve got pinpoint control over the size, spacing and number of offsets you can create for any filled object.